Disk image is a copy of the entire contents of a storage drive. The disk image represents the content just the way it appears on the original drive, including both data and structure information. The Disk Image Backup in IDrive helps to recover from an OS crash within minutes. All you need to do is, create the partition as similar in original computer partitions and restore the operating system backup as it was earlier, via disk image. You can easily restore the disk image data backed up from one computer to another computer (with dissimilar hardware). A USB bootable flash drive to boot your computer. You can download the WinRE ISO files for X86 OS architecture and X64 OS architecture, mount it and copy the entire contents on to a USB bootable flash drive. Alternatively you can learn how to create a WinRE boot disk. Download the below IDrive Disk Image Utility (IDriveDiskImage.exe) and copy it to the USB drive (WinRE boot disk) that has the boot files. The Disk Image backup of your Operating System drive that you backed up using IDrive application. New hard disk to which you can perform the restore operation. Connect your USB drive (WinRE boot disk) and start the computer in the WindowsRE environment. A command prompt with ‘x:\windows\system32>’ window appears. Open backup.ini from the IDriveDiskImage\<Computer Name>\C\Backup.ini folder to get the MBR/GPT/OS disk size to create the partition. Locate your MBR.img/GPT.img from IDriveDiskImage folder and create the partition using disk part command, using steps to create MBR / GPT partition. Locate the Operating system drive Disk Image file (E.g. : DiskImage[C].img) and create the partition with disk part command, using steps to create OS drive partition. Restore the MBR /GPT drive image, using steps to restore MBR / GPT image. Restore the OS drive image, using steps to restore OS drive image. 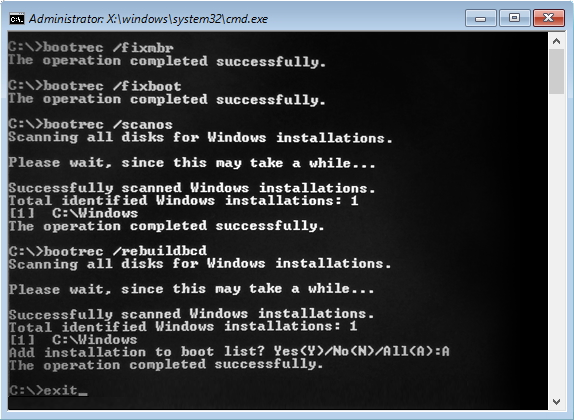 Execute the Booting commands, using steps to get the operating system to boot. 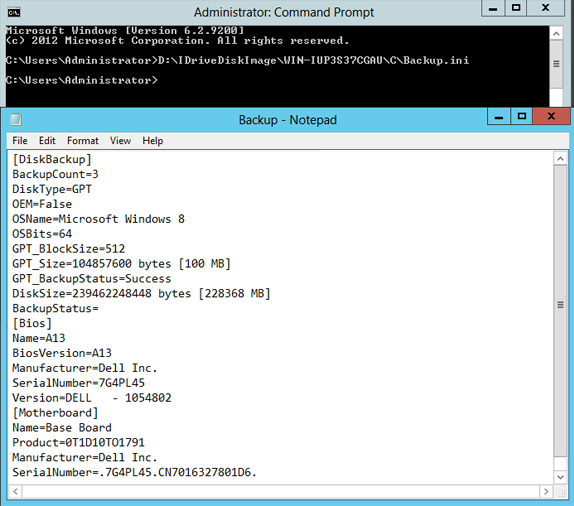 Enter Diskpart in the command line window to create the MBR partition as said below. DISKPART>LIST DISK Display’s list of disks available on the PC. DISKPART> SELECT DISK 0 Where 0 is the hard disk where partition has to be created for restore operation. DISKPART> CLEAN Performing clean command will wipe out entire hard disk. DISKPART> CONVERT MBR Converts the disk to master boot record partition style. DISKPART>CREATE PARTITION PRIMARY SIZE=500 Size in MB. [Get the MBR Size from the backup.ini, Provide extra size of 200 MB to create partition] Creates a partition of 500MB with partition as primary. Note: It is recommended to provide a size greater than the image size for MBR.img. DISKPART>FORMAT FS=NTFS QUICK Formats the partition to NTFS file system. Make sure partition type is NTFS. DISKPART>ASSIGN LETTER=M Assign drive letter to M. Drive letter can be assigned randomly. 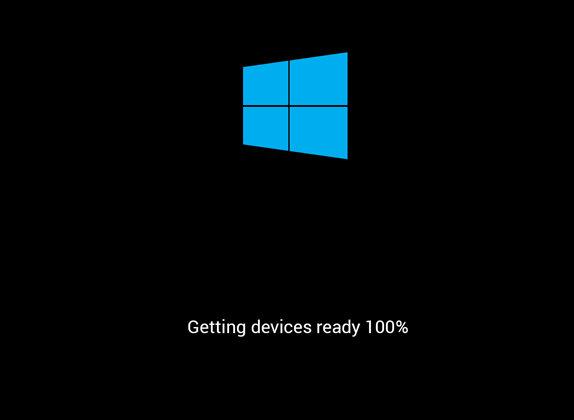 DISKPART>ACTIVE Makes the partition active for booting. Enter Diskpart in the command line window to create the GPT partition as mentioned below. Enter LIST DISK command and select the disk number of your hard disk. Creates a partition of 500MB. DISKPART > FORMAT FS=FAT32 QUICK Formats the partition. Make sure partition type is FAT32. DISKPART > ASSIGN LETTER=M Assign drive letter to M. Drive letter can be assigned randomly. 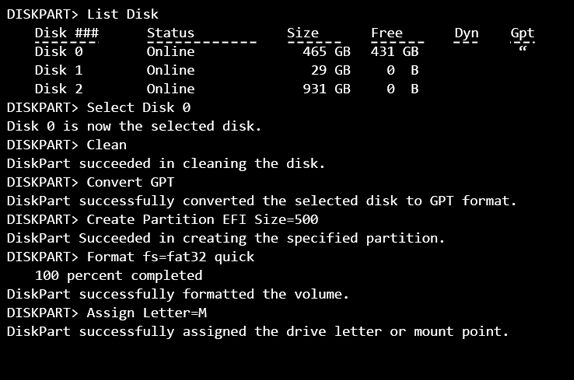 Enter Diskpart in the command line window to create the OS drive partition as mentioned below. DISKPART> CREATE PARTITION PRIMARY SIZE=29649 Get the size of OS Drive (in MB) from the backup.ini. Size should be equal to or greater than the original OS size in MB. DISKPART> ASSIGN LETTER=H Assign letter H. Letter can be assigned randomly. *Get the Image size of operating system disk image from the "backup.ini"
After the MBR/GPT and Operating system disk image is restored to the respective partitions, run the chkdsk command from the command line. Enter the drive letter, which has Operating system, restored from the command line. Run chkdsk /f to force the partition to check for any drive integrity issues. Wait for the check disk to complete the error checking if any in the file system. Displays total identified windows installation. Choose the number from the list displayed to boot. Enter Y and press enter to finish the operation. Disconnect USB pen drive and any external drive attached. Reboot the system to boot from operating system. Recovery of the Operating System drive in complete. Booting to operating system is now complete. Copy IDriveDiskImage.exe to WinRE boot disk. 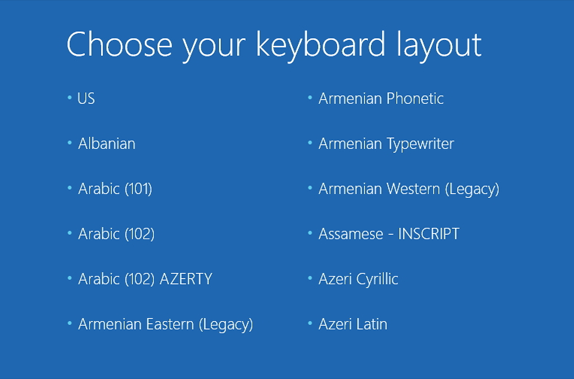 Choose your keyboard layout to US > Troubleshoot > Advance options > Command Prompt. A command prompt with 'x:\windows\system32>' window appears. Once the code has been executed, restart your computer. You will have recovered the computer’s Operating System from the disk image file. If you need further assistance, you may contact IDrive Tech support.